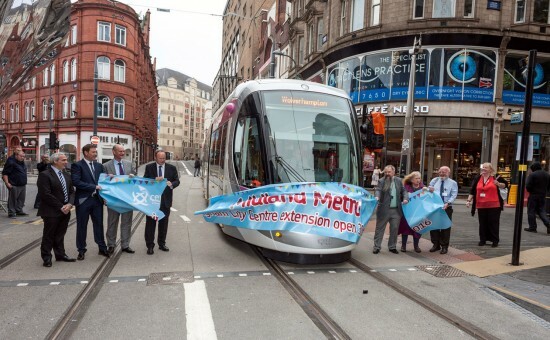 The latest section of Midland Metro opened to the public on Monday 30th May with trams now running through to Grand Central. This is the last section of the originally envisaged Birmingham City Centre extension although with further extensions to follow it will not be the last time that we enjoy a route opening on the network. 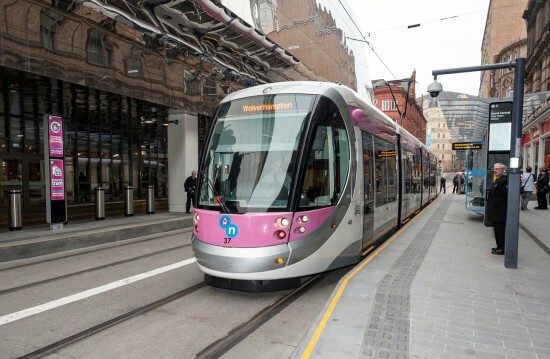 As we have reported extensively the extension of Midland Metro between Bull Street and Grand Central (New Street Station) has been much delayed in its opening (indeed one local newspaper has reported the extension has been built at the rate of 32 inches per day!). It has originally been planned it would open in December 2015 along with the line through to Bull Street but this proved not to be possible and then the announced date of 22nd May was also missed following the discovery of remedial works required before a full service could be operated. 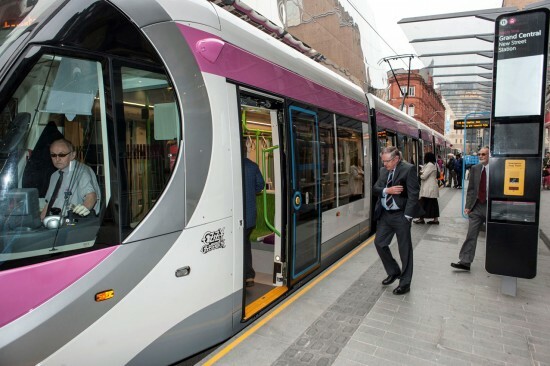 With this work duly completed and a full seven days of driver training having taken place it was possible for Midland Metro to start full services from the start of service on Monday 30th May. A Sunday timetable was in operation on this day which meant that services started at 0800 with 37 the tram chosen to form this inaugural service. 37 had been in the news just a few days earlier when Ozzy Osbourne was in the city to reveal his name on the tram. Having arrived at Grand Central 37 then pulled forward to reverse and then as it approached the outbound platform it broke through a banner celebrating the opening of the line. Other trams in service on this day were 24, 29, 31, 20 and 34 with trams running every 15 minutes. Although it has been announced by Midland Metro that the new stop at Snow Hill would open on the first day of services to Grand Central in the end this wasn’t possible as there was still some work to undertake on completing the stop. 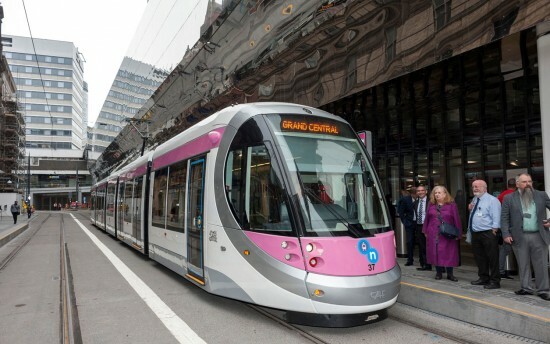 Despite this the Midland Metro network did increase its number of stops by two with the terminus at Grand Central joined by that at Corporation Street. With the Birmingham City Centre extension now complete attention will be turned towards the continued expansion of the network. Work has already begun on extending the route to Centenary Square (services from 2019), with further routes along Broad Street to Edgbaston via Five Ways (by 2021) and to Digbeth also being planned (due to open by 2023). Coupled to this at the other end of the line plans are being developed to extend Midland Metro to Wolverhampton Railway Station. 37 breaks the banner as services to Grand Central start. 37 waits at Grand Central. 37 stands at the outbound stop. Wow! Thats brilliant. I love it when a new tram extension opens! Isn’t the extension to Edgbaston just a further elongation of the line from Centenary Square, and not a further route? Or is it intended to operate the Wolverhampton service only to Centenary Square and the Edgbaston service as a separate route, say, only from Grand Central? My understanding is that the Digbeth extension will see a service from five ways to Digbeth (a shuttle service) and the Wolverhampton service may terminate earlier but I am not sure where. I still can’t get used to the name Grand Central being used for this stop. I know from the photos posted that the stop sign says New Street Station underneath Grand Central, but the stop is outside the main entrance to the station.